As nights begin to cool, come together with friends over these warming beverages and delicious desserts. Brewing a pot of MAXWELL HOUSE Coffee is easy. So are the recipes on this website that you can use to create special beverages. Ours resemble coffeehouse offerings in every way but one: They’re better-for-you! Here are some delicious ideas to get your at-home coffeehouse going. Start with an old standby. Café Latte - which is basically warm milk and coffee—is easy to make and a surefire favorite. You don’t even need a cappuccino maker for this recipe! For friends who don’t like java, serve Hot Spiced Tea. Very simply, it’s CRYSTAL LIGHT Drink Mix and a few special spices. Make it ahead of time and, when company comes, all you need to do is boil water and stir. Add special accents. 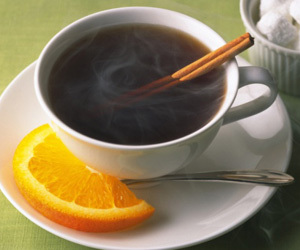 When you serve drinks like Maple Cinnamon Coffee, use a cinnamon stick as a stirrer. You can also add a dollop of COOL WHIP Sugar Free Whipped Topping sprinkled with cinnamon to nearly any coffee drink. Offer iced options. No need to forsake all chilled beverages until summer! Vanilla Chai Coffee Cooler and Cool ‘n Creamy Coffee Freeze make sweet choices for sipping in front of a blazing fireplace or outdoor fire pit.